NaNoWriMo Weeks 4-5 | What's On My Nightstand? November 20th-30th are the final days of NaNoWriMo*. Come join the writing fun with the RaiderWriMos here at Oakton. All our Write-Ins and Write-Ins/Workshops are held in Oakton Community College’s Library Classroom, Room 2418 at the Des Plaines Campus. The end is near! You’re feeling great about your novel. You’ve written more words in three weeks than you’ve ever written before. Maybe you’re still trying to play catch up, but that is OKAY because you still have a week, and you are not going to quit now. Come to this important write-in, and then join us as we host our last during writing 30-minute workshop to discuss common Week 4 challenges and share tips for thriving this week, and finishing your draft. This is it! 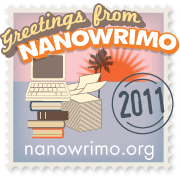 You’ve survived the month, and now it’s time for our final write-in of the 2011 NaNoWriMo season. Join us as we eek out those last few words to reach our goal, and do some much-deserved celebrating together. After all, you have just written a novel! A NOVEL!!!! It’s time to celebrate!